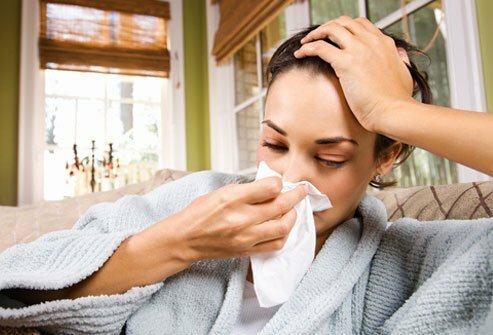 What are the differences between allergy, cold, and flu symptoms? What are the different types of medications for headaches, body aches, fever, and flu-like symptoms? What medications relive nasal congestion, sneezing, and a runny nose? What over-the-counter (OTC) drugs for nasal congestion, sneezing, and a runny nose? What cough suppressants and expectorants help relieve symptoms from the cold or flu? What over-the-counter (OTC) medications help relieve sore throat pain and other symptoms? What about vitamin C and zinc? What should I know about OTC products relieve allergies and treat a cough? What should I know about topical sprays, decongestants, and expectorants to treat a cough? The three classes of pain and fever treatments available over the counter (OTC) are aspirin, acetaminophen (Tylenol), and nonsteroidal anti-inflammatory drugs (NSAIDs). Antibiotics have no effect on viruses, which are the cause of colds and the flu. However, bacterial infections that can follow viral infections, for example, infections of the ears and sinuses, may be treated with antibiotics. Nasal decongestants (for example, pseudoephedrine, oxymetazoline, etc.) narrow the blood vessels in the nose, thereby preventing fluid from leaking and the lining from swelling. These can be used for short-term relief in older children and adults. Analgesic/antipyretic medications are often sold in combination with other ingredient(s) to treat cold/flu/allergy symptoms. Antihistamines are commonly used to block the histamine effect that causes the symptoms of an allergic reaction, including swelling, congestion, irritation, and itching. "First generation" antihistamines such as diphenhydramine (Benadryl) have been in use longer, are less expensive, and are more sedating (prone to cause drowsiness) than the newer, "second generation" antihistamines (fexofenadine [Allegra], loratadine [Claritin], etc. ), which have minimal sedative effects. OTC antihistamines frequently are combined with a nasal decongestant and sometimes also with a cough suppressant or an analgesic. Generally, antihistamine preparations are not effective for cold symptoms. Codeine and hydrocodone are narcotic oral cough suppressants that require a doctor's prescription. Dextromethorphan (Tussin P) is an oral cough suppressant that is available OTC. Guaifenesin (Robitussin, Mucinex) is an oral expectorant that is used to increase the leaking of fluid out of the lung tissue and into the airways. There is no conclusive evidence that mega-doses of vitamin C prevent colds or decrease the severity and duration of cold symptoms. Aspirin-containing medicines should never be used for children and teenagers with influenza, chickenpox, or other viral illnesses. Unsure about the hundreds of cold and flu preparations on the drugstore shelves? You're not alone. Deciding among the OTC (over-the-counter) remedies for cold, flu, or allergy symptoms can be intimidating, and a basic understanding of the types of drugs included in these medications can help you make an informed choice. Millions of people use over-the-counter (OTC) products to relieve symptoms of cold, flu, and allergy, including nasal stuffiness and congestion, sneezing, runny noses, sore throat, and cough. The common causes of these symptoms include the viruses that cause the common cold, influenza virus, allergic rhinitis (hay fever), and sinus infections (sinusitis). Viral infections can also cause headache, body aches, fatigue, and sometimes fever. Hay fever symptoms can also include itchy eyes, nose, and throat, and watery eyes. To benefit from OTC products for cold, flu, and allergy, it is important to understand (1) the condition causing the symptoms, (2) the predominant symptom(s) one wishes to relieve, and (3) the active ingredient(s) in the product. Some OTC products contain a single active ingredient medication to relieve one symptom. Many others contain a combination of two, three, and even four active ingredient medications to treat several symptoms at once. Selecting the right product can be difficult at times. Since cold and flu sufferers usually experience several symptoms, products containing medication combinations provide convenience. Therefore, you may need to take only one product as compared with two to four products. You also may need to stock fewer items in the medicine cabinet. Nevertheless, it is preferable to take products that contain only those medications you need for relieving the symptoms that are present, and you may not need products designed to relieve multiple symptoms at once. This prevents the ingestion of unnecessary medications and reduces the chances of side effects. It is also easier to adjust the dose of a single ingredient medicine to maximize relief of a predominant symptom and minimize side effects. While colds, the flu, and allergies may produce some similar symptoms, they are different conditions. Colds and flu are both viral illnesses that cause sore throat, muscle aches, cough, sneezing, and runny nose. In general, flu, or influenza, produces more severe symptoms than the common cold and is commonly associated with fever (which may be high), body aches, and headache. Nausea, vomiting, and diarrhea can also accompany the flu. Colds are more likely to produce a low-grade fever, if fever is present. Sometimes it is difficult to distinguish a common cold from the flu. Allergies, particularly hay fever or seasonal allergic rhinitis, can produce runny nose, watery, itchy eyes, and sneezing. Allergies usually do not cause fever, muscle aches, or nausea and vomiting. Medications that reduce pain (analgesics) and fever (antipyretics) are used to relieve headaches, body aches, and fever. The three classes of analgesics/antipyretics that are available OTC are aspirin, acetaminophen, and nonsteroidal anti-inflammatory drugs (NSAIDs). Some OTC products contain an analgesic/antipyretic as a single ingredient. Others combine an analgesic/antipyretic with a nasal decongestant, an antihistamine, or a cough suppressant. Products listed in the headaches, body aches, fever, and flu-like symptoms category contain an analgesic/antipyretic either alone or in combination with other ingredient(s) to treat cold/flu/allergy symptoms. Examples of products in the headaches, body aches, fever, and flu-like symptoms category include the following. Note that the products described in this article refer to brand name preparations. Less expensive, generic, over-the-counter medications are available that contain the same active ingredients as many if not all of these products. Nasal congestion, sneezing, and runny nose are common symptoms of a cold caused by a virus. The viruses that cause colds induce inflammation that increases the leakage of fluid from the blood vessels into the lining of the nose and even into the nose. This causes swelling of the lining of the nose, obstructing the flow of air, and a runny nose. Symptoms of hay fever, or allergic rhinitis, are caused by allergens. Allergens are tiny particles that cause cells in the lining of the nose and the airways of the lungs to release histamine and other chemicals. Histamine and these other chemicals are responsible for the leakage of fluid, runny nose, sneezing, and nasal congestion, as well as the itching of the eyes. Cold symptoms usually resolve in one to two weeks whether treated or not. Antibiotics have no effect on viruses, which are the cause of colds. However, bacterial infections that can follow viral infections, for example, infections of the ears and sinuses, may be treated with antibiotics. For the temporary relief of cold symptoms, plenty of oral fluids such as broth, chicken soup, and tea with lemon and honey and humidification of room air are safe remedies for people of all ages. Saline (salt and water) sprays and mists can also safely provide soothing moisture to dry, irritated nasal passages. In infants and young children, saline nose drops and clearing the nose with a nasal syringe can temporarily relieve nasal obstruction. Allowing infants and young children to sleep upright in car seats also improves the drainage of nasal secretions. For short-term relief of nasal congestion in older children and adults, nasal decongestants can be used. Nasal decongestants are chemicals (for example, pseudoephedrine, oxymetazoline, etc.) that narrow the blood vessels in the nose, thereby preventing fluid from leaking and the lining from swelling. As a result, the lining shrinks and the nasal passages open. Nasal decongestants can be used topically within the nose (nasal spray, solution, or mist) or can be taken orally (tablets, caplets, or gelcaps). Topical nasal decongestants act faster than the oral decongestants but have a shorter duration of action. Thus, more frequent dosing will be necessary. Oral nasal decongestants frequently are combined with an antihistamine, a cough suppressant, or an analgesic in treating cold/flu/allergy symptoms. The first step in preventing and relieving symptoms of allergy is to avoid the allergens, the particular substance that stimulates the allergic reaction. If avoiding allergens is not feasible or does not adequately control the allergic symptoms, antihistamines are commonly used to block the effect of histamines. Some of the antihistamines that are available OTC (diphenhydramine, chlorpheniramine, etc.) are called "first generation" antihistamines. These antihistamines have been in use longer, are less expensive, and are more sedating (more prone to cause drowsiness) than the newer "second generation" antihistamines (fexofenadine, loratadine, etc. ), which have minimal sedative effects. OTC antihistamines frequently are combined with a nasal decongestant and sometimes also with a cough suppressant or an analgesic. Generally, antihistamine preparations are not effective for cold symptoms. Topical nasal decongestants as nasal sprays, mists and drops: Afrin Regular Nasal Spray, Afrin Nose Drops, Duration 12 Hour Nasal Spray, Neo-Synephrine Nasal Sprays, and Vicks Vapor Inhaler. Note: Decongestant nasal sprays can lead to a rebound worsening of nasal congestion and become habit-forming, especially if overused. Oral nasal decongestant: The only OTC decongestants available in oral form are phenylephrine (such as Sudafed PE) and pseudoephedrine (Contac Non-Drowsy, Sudafed, and Neo-Synephrine). Medicines that contain pseudoephedrine are limited to being sold behind the counter, even though you may not need a prescription to buy them. A cough is a common symptom of viral respiratory infections and allergies. A cough can also be caused by other conditions, some of them serious. For example, a cough can be a symptom of asthma, acid reflux into the esophagus (gastroesophageal reflux disease or GERD), sinusitis, postnasal drip, bronchitis, cigarette smoking, pneumonia, tuberculosis, hypersensitivity pneumonia (inflammation of the lung from exposure to certain environmental chemicals), and even lung cancer. Therefore, a persistent cough or a cough that is associated with chest pain, fever, weight loss, or blood-tinged or discolored sputum should be evaluated by a doctor. There are three types of cough medications available OTC for the temporary relief of cough due to a cold. They are oral cough suppressants, oral expectorants, and topical (externally applied) medicines. Codeine and hydrocodone are narcotic oral cough suppressants that require a doctor's prescription. Dextromethorphan is an oral cough suppressant that is available OTC. Dextromethorphan is chemically related to codeine and acts on the brain to suppress cough, but it does not have the pain-relieving and addictive properties of codeine. Diphenhydramine is another non-narcotic medication that acts on the brain to suppress cough. It is also an antihistamine. Dextromethorphan and diphenhydramine can be used to relieve a dry, hacking cough. They are not generally used to suppress a productive cough (when sputum is coughed up). Suppressing a productive cough impairs the clearing of secretions and mucous from the airways, which is generally undesirable. However, cough suppressants are sometimes used to suppress even productive coughs if they are especially bothersome and prevent restful sleep. Guaifenesin is an oral expectorant that is believed to increase the leaking of fluid out of the lung tissue and into the airways. This action thins (liquefies) the thick mucus in the airways and facilitates the clearing of the mucous by coughing. Clearing of mucous from the airways decreases cough. Viruses are the most common cause of sore throat. A sore throat caused by a cold virus usually resolves in one to two weeks without treatment. On the other hand, a sore throat caused by the Streptococcus bacterium (strep throat) should be treated with antibiotics to prevent damage to the heart valves and other complications of strep infection. Generally, Streptococcus bacteria cause a more severe sore throat and a higher fever than viral sore throats, but it is not always possible to distinguish the two without laboratory testing. Sneezing, runny nose, and cough more frequently accompany sore throats due to a cold virus, rather than Streptococcus infections. Sometimes, a throat culture or other lab test is necessary to establish the cause of the sore throat. Medications that are available OTC for the temporary relief of sore throat due to the common cold usually contain anesthetics such as benzocaine and dyclonine or menthol and come in the form of lozenges, gargles, and sprays. Children often prefer popsicles, ice cream, yogurt, pudding, smoothies, or other cool/soft foods in lieu of traditional medications. Aside from their analgesic effects, these foods also provide some nutritional benefit. Examples of sore throat medications include Cepacol Sore Throat Maximum Strength and Sucrets sore throat lozenges. Vitamin C is an antioxidant. In the 1970s, Linus Pauling proposed that vitamin C could reduce the incidence and severity of common cold. To date, there is no conclusive evidence that megadoses of vitamin C prevent colds or decrease the severity and/or duration of cold symptoms. Medical research has suggested a small decrease in duration of cold symptoms in adults who took vitamin C supplements regularly, but that vitamin C taken after the onset of symptoms had no effect on the duration of cold symptoms. Zinc has been proposed as an antiviral medication. Some studies suggest that the frequent administration of zinc lozenges, tablets, or syrup may reduce the severity and duration of cold symptoms if started within hours of the onset of cold symptoms. However, certain side effects and toxicities, including loss of sense of smell, have been associated with some zinc preparations used to treat colds. In fact, the U.S. FDA has issued a public health advisory warning that three zinc-containing products for topical (intranasal) use should not be used due to the risk of developing this side effect. To use OTC products safely, it is important to understand (1) their side effects, (2) their effects on other underlying medical conditions such as diabetes mellitus, high blood pressure, asthma, and other conditions, (3) their interactions with other prescribed medications such as antidepressants, blood thinners, and high blood pressure medicines, and (4) the product's limitations. These guidelines are provided to help consumers make more informed choices when selecting OTC products. Always read the labels and know the ingredients in the products. Never take more than the recommended dose without checking with your doctor first. Do not use aspirin-containing medicines for children and teenagers with influenza, chickenpox, or other viral illnesses. Rare cases of Reye's syndrome have been associated with the use of aspirin in this population. Reye's syndrome is a serious illness characterized by liver damage, vomiting, and sometimes coma. It has a 50% mortality rate, and those who survive can be left with permanent brain damage. Therefore, acetaminophen-containing products or NSAIDs are recommended for children with fever. NSAIDs may be used in children over 6 months of age. Aspirin and NSAIDs can cause ulcers and increase the risk of bleeding and should be avoided by people with known ulcer disease or certain blood diseases. People who are scheduled for elective surgeries should inform their doctors that they are taking aspirin or NSAIDs. A true aspirin allergy is rare. Aspirin allergy consists of hives, occasionally difficulty breathing, and rarely shock, within three hours of taking aspirin. Aspirin allergy is most common among individuals who have asthma, urticaria, and nasal polyps. Individuals with aspirin allergy should also avoid NSAIDs because they are chemically similar to aspirin. Aspirin can cause complications during pregnancy and should be avoided during pregnancy. Aspirin can increase the effectiveness of blood thinning by warfarin (Coumadin) and may increase the risk of bleeding. Topical (sprays or mists) nasal decongestants act more quickly than oral nasal decongestants. However, the effects of topical nasal decongestants are short lived. Topical nasal decongestants should be used for only three to five days at a time since more prolonged use can lead to rebound congestion with worsening nasal congestion. Patients with rebound congestion complain of stuffy nose despite frequent applications of the nasal decongestant. Treatment of rebound congestion involves the slow withdrawal of the nasal decongestant (one nostril at a time) and applying saline nose sprays or drops to provide moisture. Nasal decongestants can aggravate high blood pressure and should not be used in people with uncontrolled high blood pressure without permission from the doctor. Oral nasal decongestants can interfere with the action of a class of antidepressants called MAO inhibitors. Oral nasal decongestants can affect diseases such as hyperthyroidism, diabetes mellitus, and coronary artery disease. Oral nasal decongestants and antihistamines can also precipitate urinary obstruction in patients with enlarged prostates (prostate hypertrophy or BPH). Patients with these conditions should consult their doctors before using OTC products. United States. Centers for Disease Control and Prevention. "Cold Versus Flu." Aug. 11, 2016. <http://www.cdc.gov/flu/about/qa/coldflu.htm>. United States. U.S. Food and Drug Administration. "Drugs." Feb. 28, 2017. <http://www.fda.gov/Drugs/default.htm>. Discover the difference between a cold and the flu. Learn common symptoms of a cold and the flu. Read about cold and flu treatments such as over-the-counter medicines. What treatments did you use for your cold, flu, and/or allergies? Please describe your cold, flu, or allergy symptoms. Discuss your symptoms and any tests or exams that led to an allergy diagnosis. When you get a cough, what treatment or remedies help soothe your symptoms? If you get sore throats, what treatment works best? Please share home remedies for treating a sore throat. Aches? Pain? Fever? This Cold & Flu Quiz tests your knowledge on the difference between coming down with the common cold and sickness from influenza virus. Take this quiz to learn the truth behind the infectious, contagious, uncomfortable disease known as the common cold. Test your knowledge of colds; get prevention tips, and learn what you may want to avoid when treating a cold! Is it contagious? Take this quiz to learn about contagious diseases, how contagious diseases are spread, and myths and facts about contagions. Duodenal biliary drainage is a procedure used to help diagnose gallstones. A duodenal biliary drainage procedure is fairly risk free and painless. Every year in the United States, on average, 5%-20% of the population gets the flu, more than 200,000 people are hospitalized from flu complications, and about 36,000 people die from flu. The flu is highly infectious and is a serious viral respiratory infection. Flu vaccine is an inactivated vaccine, meaning that it contains killed influenza virus. Anyone who wishes to reduce their risk of getting the flu can be vaccinated, however the U.S. Centers for Disease Control and Prevention recommends that people who are at risk for serious complications from the flu be vaccinated each year. 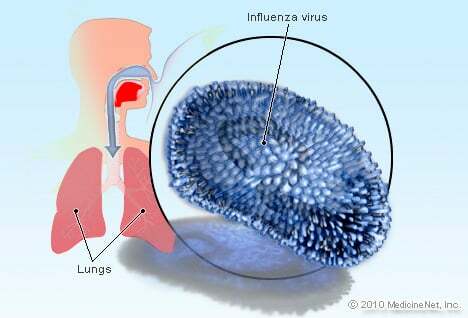 The flu is caused by viruses that infect the respiratory tract which are divided into three types, designated A, B, and C. See a picture of Influenza Virus and learn more about the health topic. Sinus infection (sinusitis) is caused by allergies, infection, and chemicals or other irritants of sinuses. Signs and symptoms are headache, fever, and facial tenderness, pressure, or pain. Treatments of sinus infections are generally with antibiotics and at times, home remedies. Sinus infection (sinusitis) symptoms can include headaches, a sore throat, and toothaches. Chronic sinusitis may be caused by allergies and can last up to three months. Antibiotics and home remedies can relieve sinus infection (sinusitis) symptoms. Mucus is a normal substance produced by lining tissues in the body. Excess mucus or mucus that is yellow, green, brown, or bloody may indicate a problem. Mucus production may increase when allergies, a cold, flu, cough, or sore throat are present. Antihistamines and cold and flu medications may help alleviate excess mucus. A neti pot may be used to decrease nasal congestion and clear mucus.